The Besse Hotel, built in 1926, is a 12-story fireproof concrete structure located at 121 East 4th Street in downtown Pittsburg. The design by architects W. T. Schmitt and Hawk & Parr of Oklahoma City utilized a traditional three-part building form, popular Late Gothic Revival architectural ornament, and a modern ziggurat massing. 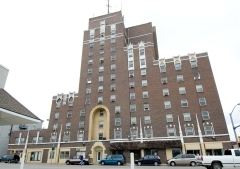 They also provided the Besse Hotel with the latest technologies for life safety and visitor convenience, such as a fireproof reinforced concrete structure and private baths in each room. The Besse Hotel closed in 1979. It is being rehabilitated for use as apartments. 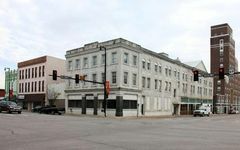 It was nominated for its architectural and historical significance as a grand early-twentieth century hotel constructed in a small southeastern Kansas city. The one-room, vernacular stone, school building was constructed in 1869 with classes being held there until 1955. 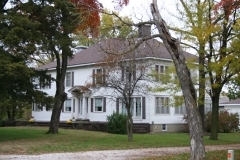 The Cato School is nominated in the Historic Public Schools of Kansas multiple property submission as an example of the one-room country school property type dating from the early statehood period (1861-1880). Built in 1919, the Colonial Fox Theatre is nominated for its association with Pittsburg's entertainment history and for its Italian Renaissance Revival architecture. 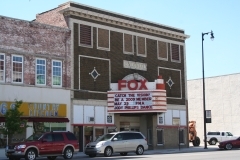 Between the two world wars, the Colonial Theatre, as it was called before the 1950s, was one of several theaters that anchored downtown entertainment and nightlife in southeast Kansas' largest city. The story of the early efforts to erect a courthouse in Crawford County is quite colorful. Girard became the county seat in 1868 and occupied a 20' x 40' frame building. A petition to build a more permanent building failed in 1870 and the county purchased a stone commercial building. A tornado foiled their efforts to erect a brick courthouse in 1872, and the need for a permanent building became more urgent by the mid-1880s as the neighboring town of Pittsburg gained prominence. Its population tripled that of Girard's by 1883. 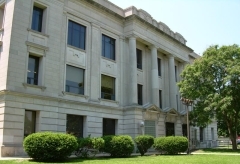 Like other early county seats, Girard was slowed by a state law that prohibited the construction of courthouses without a bond election. The law made it impossible for the county to obtain majority support for a new courthouse in Girard, where a small percentage of the county's population lived. To skirt the law, Girard retained an architect to design a new brick "city hall" on the courthouse square. After the building's completion in 1889, the City of Girard promptly donated the three-story brick Gothic Revival building to Crawford County. The building, however, lacked structural integrity from the beginning and it was demolished in 1919. The Kansas Legislature passed a law eliminating the bond-issue requirement in 1917 paving the way for a new courthouse to be built in Girard. The current Classical Revival-style courthouse was designed by Oklahoma-based firm of Tonini and Bramblet and completed in 1922. 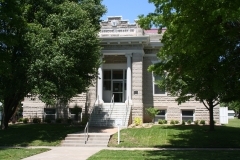 It was nominated as part of the "Historic County Courthouses of Kansas" multiple property listing for its association with local government and its Classical Revival architecture. The First Presbyterian Church was built in 1888 in a residential neighborhood one block north of Girard's courthouse square. 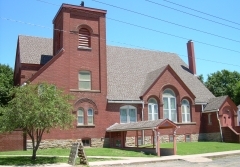 The congregation organized in 1869 and purchased the land on which this building sits in 1870. Their original frame building was destroyed by a tornado in 1886 prompting the congregation to erect this larger masonry structure. Among the members who contributed to the rebuilding effort were Henry and Sarah Alice Haldeman, who owned the State Bank of Girard, and John E. Raymond, a pioneer hardware dealer, banker, and philanthropist. The building's architects were Charles Crosby Miller and Joseph A. Thain of Chicago. However, their level of involvement in the church's design is unknown. The building is nominated for its architectural significance as a good local example of Romanesque Revival architecture. Pittsburg’s Fourth & Broadway Historic District is located at a prominent intersection in the center of the town’s original plat. These streets were the first to be graded and developed after Pittsburg was founded in 1876, and they have continuously served as the anchor for the business district that subsequently developed along Broadway. Pittsburg’s growth was spurred by coal mining and zinc smelting. By the turn of the 20th century, Crawford County was the largest coal-producing area of the state, and Pittsburg was recognized as the center of the coal region. Buildings in the historic district include a pair of large office buildings that were occupied by many prominent mining companies, as well as their financers and lawyers. The district was also home to numerous long-standing businesses that reflected the strong social and economic stature of Pittsburg in the late 19th and early 20th centuries. Together the seven buildings form one of the most intact concentrations of historic buildings in Downtown Pittsburg. 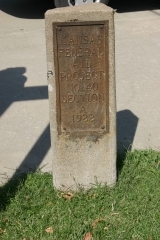 Constructed in 1936 with federal funding assistance, the Franklin Sidewalk connects two rural mining communities in Crawford County - Arma and Franklin. It was erected, in part, due to increased foot traffic along U.S. Highway 69 as a result of school consolidation in the late 1920s. Franklin was smaller than Arma and was hit hard by the declining mining industry in the late 1920s and 1930s. Franklin residents relied heavily on businesses in Arma for goods and services. Safe pedestrian travel between Arma and Franklin appears to have been the key reason for the sidewalk's construction. State Highway Commission records indicate that the sidewalk was built as part of a 1.7-mile project that involved improvements to ditches and drainage, bridges and culverts, grubbing hedges, grading, surfacing, grass seeding, and signage. The 3-foot wide sidewalk begins at the south edge of Arma and stretches south 1.7 miles to the south edge of Franklin, and runs parallel along the east side of Business Highway 69. The 1928 Frisco Freight Depot sits on property formerly owned by the Frisco Railroad and its subsidiaries since 1877. This building is the third–and only remaining–depot constructed at this location in Pittsburg. During the late 19th and early 20th centuries, Pittsburg was a hub for rail traffic, mostly due to the proliferation of the region’s coal mining production. During the town’s railroad heyday, Pittsburg was served by at least five railroads, each with their own local depot (freight, passenger, or combination). Frisco’s 1928 freight depot is the only extant depot in town and only one of a few freight-only depots left in the state of Kansas. 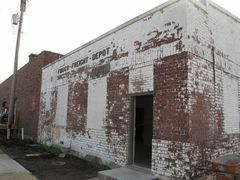 Although in use in the waning years of rail traffic, this building is significant for its association with Pittsburg’s railroad history from its construction in 1928 to 1958 when the depot ceased to be used for freight transfer. This building is also significant as a rare and highly intact example of its type.